Daily Lenses 1-Day Acuvue Moist For Astigmatism Clear vision even with astigmatism! Daily contact lenses fresh and comfortable until the end of the day, correct astigmatism. With the daily contact lenses 1-Day Acuvue Moist For Astigmatism in 30 format you will have lenses for 15 sunsets if you have the same graduation in both eyes, otherwise you will have to buy two boxes with the graduation of each eye and you will have 30 sunsets. Using them daily 15 or 30 days. 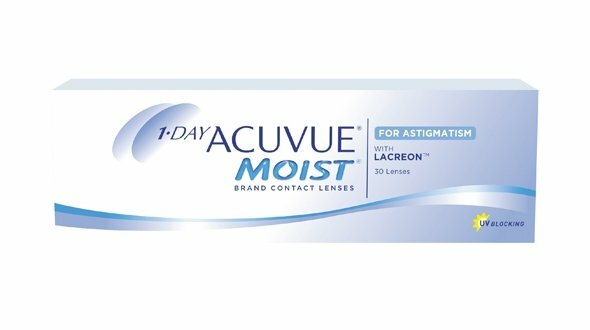 The 1-Day Acuvue Moist For Astigmatism daily lenses are a new generation of Acuvue's daily lenses. They are designed for very dynamic people and with many hours of use. These lenses, have a hydration system that prevents the eye from drying out and being a hydrogel, allows large passage of oxygen to the cornea. In addition, it has all the advantages of daily contact lenses, you wear it, you use it and the straps. Indicated for people who have very dry eyes or who want to wear the contact lenses for a long time. When ordering 1-Day Acuvue Moist For Astigmatism contact lenses in Prodevisión, bear in mind the following, that it is absolutely necessary that an Optician or Ophthalmologist will graduate your eyesight and prescribe you contact lenses. The last graduation must have been carried out in the last 6 months, unless the Optician or Ophthalmologist indicates otherwise. We recommend that you check your eyes frequently. It is absolutely necessary to take into account the recommendations for the use of 1-Day Acuvue Moist For Astigmatism lenses. Follow the advice of the manufacturer Johnson & Johnson, Optician, Ophthalmologist and never wear the contact lenses for longer than established. 1-Day Acuvue Moist For Astigmatism contact lenses require basic care and it is important to follow the recommendations. If you notice that your daily contact lenses irritate your eyes or that you do not see correctly, remove them immediately and consult your Optician or Ophthalmologist. Do not use lenses in poor condition, discard them and use new ones.